Forum Index > Historical Arms Talk > Iron Age ? Wooden helmets from Uglemosen, Lolland, Denmark. Root wood does not have a straight grain; see how it swirls around in the photos. This makes it harder to split. Bog oak is no more like ordinary oak than tanned leather is like rawhide; it has been put under pressure and chemically transformed. It may be the thicker rim of the bowls is to help with splitting, as that is where they will start to split. The massive rims make it more likely they are helmets, as thick rims like that make pouring really messy. You wouldn't do that with a food bowl. Thanks for this info. So root wood is really good for being massive and dense with no risk of grain splitting. So bog oak is transformed (so being dead oak), but still have durable qualities!! Interesting - wonder if it goes for alder as well. I also agree that both the rim and crest (seemingly no function other than to make it look like a helmet) makes it most likely it being a helmet. Were metal helmets also known in the area? If they were, it's pretty likely that these "helmet bowls" might have been ceremonial imitations with some sort of ritual or magical function, and if so then it'd make sense that we don't see any attachment points for a lining or suspension system. Actually it is fairly unknown. Very few metal helmet from the Iron Age have been found in Denmark, not even at the Illerup Bog army. You have ceremonial bronze helmets from Bronze Age Denmark, so metal helmets were certainly known for a long time, and extensive contact with Romans would have made metal helmets well known. Three metal helmets were found in Thorsbjerg Moor in Angeln [dug out by Engelhardt in 1858-61, while Holsten was still Danish]. One is a germanic silver mask helmet, inspired from Roman types. 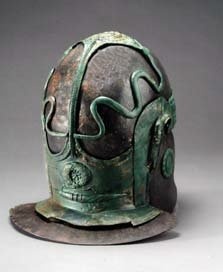 Another is a Roman cavalry helmet [which were after all mostly Germanic or Alan/Sarmartian people]. Haven't found a picture of the third one. So either helmets were very rare, or for some reason helmets (and also mail) were very rarely included in the weapon sacrifice (but still carried). It sounds reasonable that most warriors had helmets of leather, but it's unknown. [If we don't find any shoes, does that mean they fought bare-footed?]. As combat was ritualistic/magical in itself in Germanic religion I would not regard any weapon and armour as being simply profane, though weapons seems to have been deemed more important to "kill" ritualistically, than armour. As for lack of suspension system I'm wondering if the wooden helmets had organic material tied around the rim, so to provide a chin-strap that way? But if the helmet's were for a religious event it was a 1-time thing, as you have no other examples found in Denmark. Oh, the Romans LOVED their chinstraps! Usually they were fixed at the center back, crossed under then chin, and then fastened to rings or studs on the cheekpieces. Greek helmets usually show a pair of holes somewhere for a chinstrap, though not always--we're not sure if the rest might have been sewn to the lining, or what. A full-face type like the Corinthian might not always need a chinstrap, but I suspect the simpler bowl shapes like these wooden ones would tend to have something. I don't think we have good enough photographs to say anything about whether the 'helmets' show any sort of attachment points. Perhaps we expect to see large holes right through the wood, when that may not be how it was done.